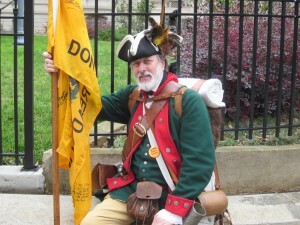 Darris Pope | The Signal William Temple proudly supports his second amendment rights by showing his colonial dress. William Temple proudly supports his second amendment rights by showing his colonial dress. “Our goal for the rally was to have guest speakers who would entertain, inform, and inspire people. To get them to stand up and take action against the tyranny of those trying to take away our Second Amendment rights,” said John Bigham, the event’s MC and one of the coordinators of the rally. According to Bigham, 13 guest speakers came and spoke to a crowd nearing 375 people who assembled to peacefully protest gun rights. “We should be able to carry firearms and protect our family if we need to do so, without permission from the government to do so,” Bigham said. Protestor and one of many guest speakers, William Temple, spoke to the gathering outside the Capitol building. William was also toting a rifle and dressed in American colonial military attire, sporting a musket, flask, and a three-pointed tricorn hat, standard attire of the time of the American Revolution. “The founders wanted us armed, and they wanted us armed sufficiently. The government has no right to be able to identify all who possess [guns],” Temple said. Lawmakers and citizens across the nation have been divided on the issues of gun control with recent legislation coming to ban assault-style weaponry and high capacity magazines. Many gun advocates feel that this gives criminals what they want, weaker unarmed targets. The congregation included protestors from various organizations such as the Georgia Tea Party, People for Gun Rights, Guns Save Lives and members of the Facebook group Second Right. Armed rallies are common for gun advocates and way they feel can help inform people and organize them towards the cause, while showing unarmed civilians they are human just like them. “If a criminal is getting ready to commit a crime on someone, they have to think, ‘Does this person have a gun?’ if there is any doubt in their mind they’re going to go the other way,” Bigham said. “All these guys are sitting here with their guns right now, and I can assure you they don’t want to shoot anybody. But they will if someone were to try to harm them or steal their property right now or someone were in danger. You don’t have to fear us, fear the criminals,” Bigham added. John Bigham is a resident of McDonough, Georgia and was one of the coordinators of today’s pro-gun rally at the Capitol building. Bigham has attended numerous armed and unarmed rallies in Washington D.C., Virginia, Tennessee and Georgia. William Temple is retired and worked for the Federal government for 32 years. Temple is a Vietnam War veteran and worked for the Secret Service and the Department of Homeland Security. A resident of Brunswick, Georgia Temple is the coordinator of the Golden Isles Tea Party. Temple now runs the Time Past Studio and composes historic and fine art, including prints, poetry, and musical compositions. He also routinely participates in war re-enactments. More information on the Guns Save Lives group can found at georgiacarry.org.